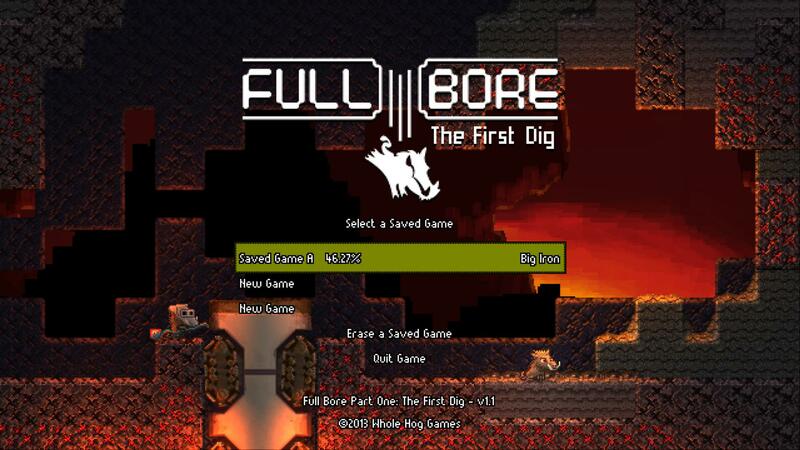 Many weeks ago, I was given a neat little game called Full Bore to review. I got hooked on it pretty bad, then something called NaNoWriMo came along and made the month of November disappear. Thirty days and 62,000 words of fiction later, I have finally been able to poke my head back into the world of games journalism, and thus give this sprawling puzzler from Whole Hog Games its due praise. Another old definition of retro visuals focuses on a limited palette, and though it may be fair to say the base palette of this game is a bit limited, the effects that flavor that palette have no such limitations. 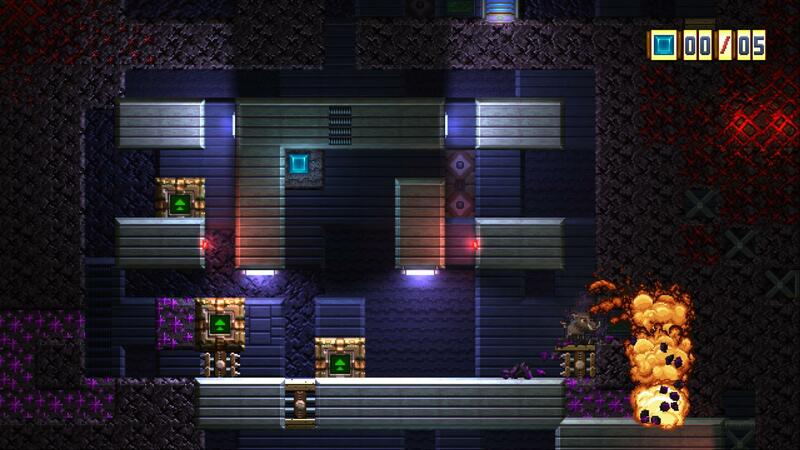 The game takes you far underground, and there you’ll find light sources of assorted colors. These lights (and the occasional patches of darkness) flavor the colors of characters and environments alike, giving the levels an undeniable tone and mood that differs from place to place. The baking orange glow of lava lets you know that you’ve tunneled your way into the depths while the yellow of glow-worms or the purple of volatile crystals or, yes, even the crispness of sunlight might set other areas apart. As you’ll learn in the gameplay section, most interactive objects are blocks, and there are so many of them (and you’re frequently tasked with making decisions regarding them so swiftly) that identifying the different types could easily have been a chore. 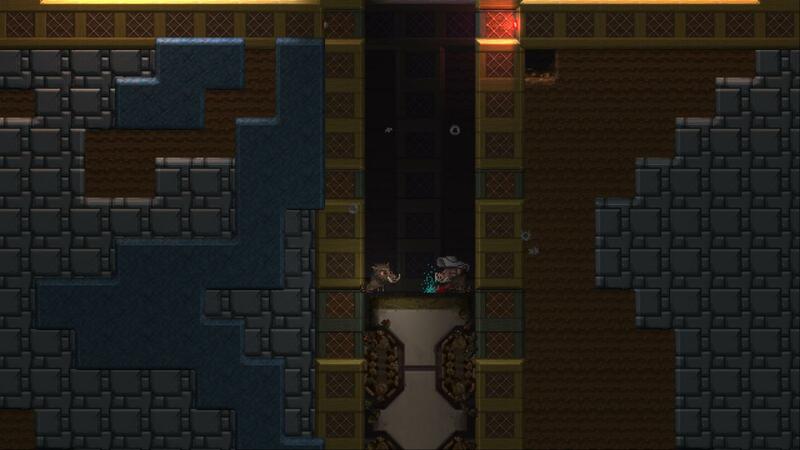 The artists behind this game did an excellent job of not only making the blocks visually distinct, they also did a good job indicating via their appearance how they might behave, whether they’ll crumble away, regrow, fire a laser, or power one. This game is a box puzzle game, but iterated and expanded on every possible axis. What do I mean by that? Well, let’s start with the basics. You can push boxes, but not pull them. You can break boxes in front of you, above you, or below you, you can climb up one box, and you can thump the ground. 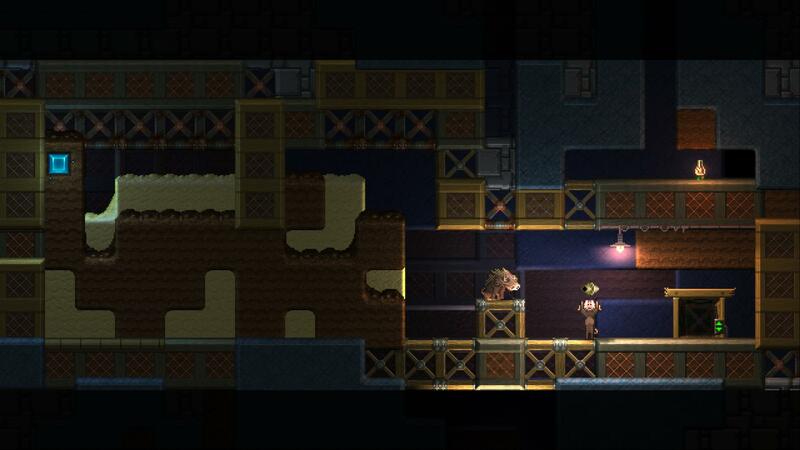 This puts us in “sokoban with a twist” territory, only vertically instead of top down, so there’s also gravity involved. Now, in sokoban-type games, there is only one type of box. In Full Bore, I lost count. Every behavior a box might have seems to be represented. There are boxes that can be: pushed and destroyed, pushed but not destroyed, crumble when you thump the ground, regrow, fill single space gaps, rise to form a platform, explode in a chain reaction, act as a power source, fire a laser that destroys otherwise non-interactive blocks… the list goes on. Not only are there that many types of blocks, but I swear each has been given at least one puzzle in which they are the star, and a dozen puzzles in which they are merely part of the ensemble. Explosions as tools! We really ARE mining! That brings us to puzzles. 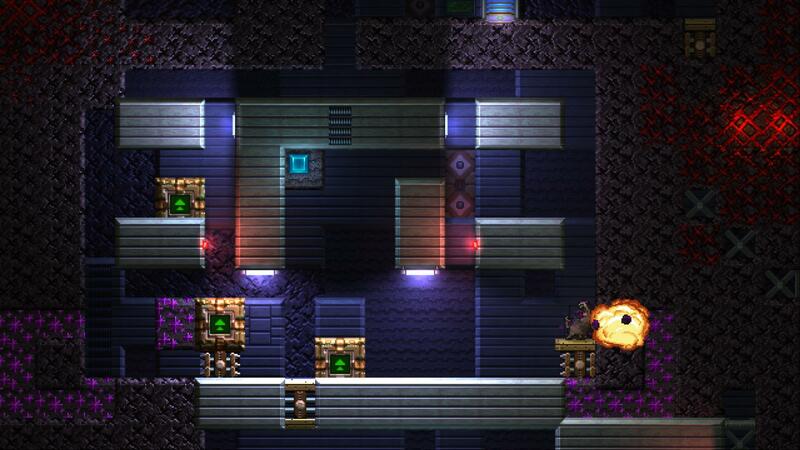 Most puzzle games of any type split the game into a series of discrete, isolated puzzles. You do what it takes to fulfill the goal, or perhaps you get from Point A to Point B. The really complex ones will give you one of each task to fulfill. 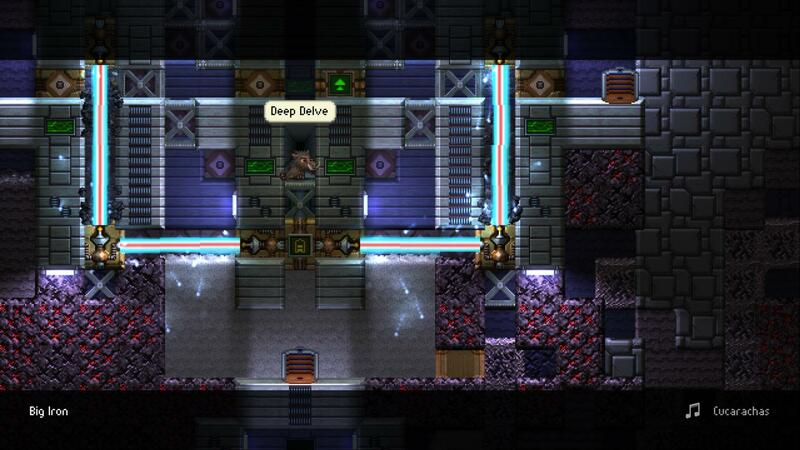 Full Bore is instead a massive, sprawling world of interconnected rooms that brings to mind Metroid-vania. Yes, you are tasked with getting from Point A to Point B, often solving a few puzzles in order to make the trip, but you’re not traversing the level simply because it is the puzzle, you’re traversing the level because that’s where you want to go. Likewise, there are collectible gems which are the primary reason for exploration, but you don’t magically finish the level once you get them all. They are just there for you to get, and often require ingenuity to reach. Having the puzzles result from the natural desire to explore the world opens up all sorts of possibilities. 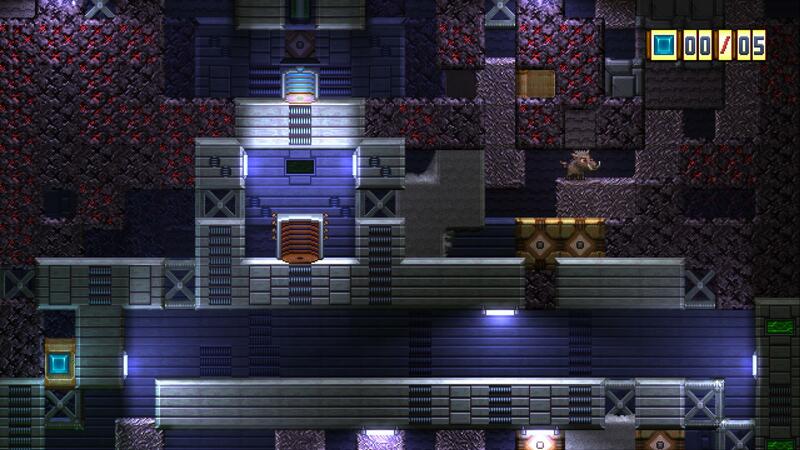 Sometimes a pile of blocks can be used to either move to the next level or reach a gem, and thus you’ll have to solve two different puzzles with the same tools. It also trains you to scrutinize the details of the world, because you’re not just checking off boxes on a to-do list for each screen, you’re figuring out what to do, how to do it, and if there are any other things you might have missed. Your many visits to each area will open up new areas, and your collection of gems will activate portal of sorts to travel and move on. If you really distill it, all of the same elements of a traditionally presented puzzle game are here, right down to the fact that your reward for solving a puzzle is usually another puzzle, but the motivation and drive to solve the puzzles is entirely different this time around. Perhaps the best part of the gameplay is the downright flawless way in which they conjured the “Oh, wait. Now I know how to solve it… Oh, no, now I know how to solve it” brain loop for me. Seriously, I felt like I was independently discovering each new step in a solution, then having to remember the previous ones, like some sort of insane version of the game Simon. And just when puzzles start to get boring, the game throws together the mechanics you’ve learned and puts together a race or a timed assault course to keep you on your toes. 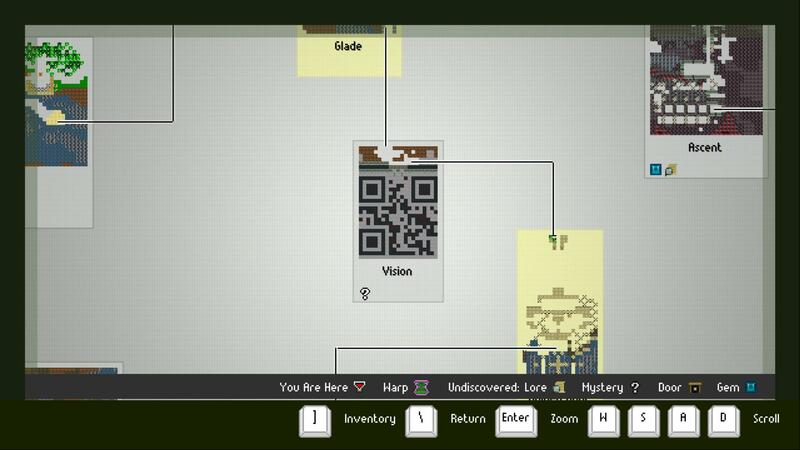 Creativity shows in every corner of the game, right down to using the block based level designs and zoomed out maps to present the user with a sneaky QR code. Well done. As I’ll say about many games, the music and effects sunk into the background for me (as they should). Nothing particularly catchy or superlative springs to mind, but neither was I motivated to mute the sound. Puzzle games frequently don’t worry much about story. Often something that’s only in the manual, or else something that is told up front and then promptly forgotten, is sufficient. Full Bore goes along the same path followed by its other component parts and ups the ante. The surface story follows your character as he (or she) is blasted into the vault of a wealthy boar who owns a mining company. Believing that you’re a thief, he sends you into his mines to earn back what you’ve stolen. Along the way you’ll meet the other workers and help them with their tasks. Laying on top of that story, though, is a deeper one. It is told via computer monitors encountered through the world. Each shows a single email from the prior residents of this place. The result is a piecemeal and free of context story about mysterious scientific experiments and their consequences. Finding out exactly what happened and how it connects to our little piggy’s activities was as much a motivating factor as the exploration and puzzle solving was for me. 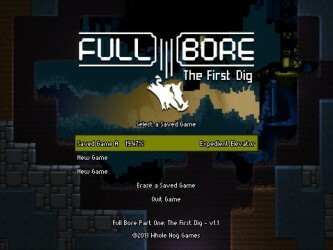 Full Bore is a fun puzzle game with polished and creative graphics and gameplay. Not only that, but as a game featuring a boar that is boring through rock with maximum effort or speed, the tile is at least a double pun. That’s worth a point all by itself. 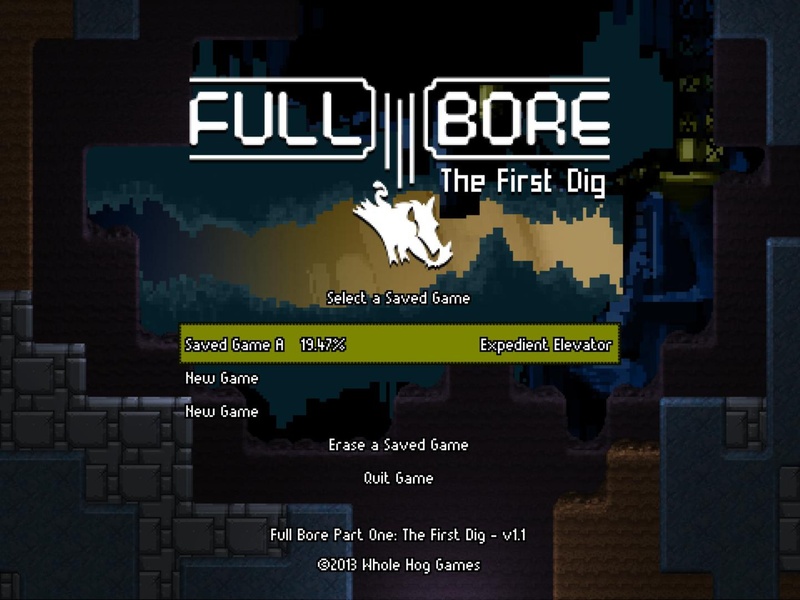 9.6 / 10: Full Bore is a puzzle game that explores every facet of its own visuals, gameplay mechanics, and storytelling and raises the bar with each.